Visiting designer Murray Moss, founder and creative mind behind MOSS design gallery in NYC, presents Interdisciplinary Design Becomes the Norm, a lecture focused on how the late 20th century was marked by a tearing down of the walls between disciplines. How does this revolution lead to evolution in the way we imagine new possibilities of making? Do the cracks in the now anachronistic silos expose more expansive, integrative forms of design we see today? 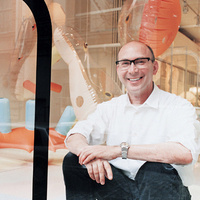 Moss will draw on his seminal role in setting the stage for contemporary design in the US.